It is all go for younger daughter S. It's a double party weekend, hot on the heels of a double party weekend last week. And once again I had the pleasure of a Saturday morning in Tumblers (soft play venue) in Buckingham, while B took P to her extra ballet lesson. We are most definitely in that phase where the kids (especially the 3-year-old) have a better social life than the parents and our role is simply as unpaid taxi service. I'm actually happy that S has been invited to so many parties this month as it is a reflection of the friendships she is developing at nursery. It is hard for P though who forgets that she is usually the one with the invitations and S who is left behind. I am getting very tired of hearing "I wish I could be going... It's not fair S gets all the sweets and cake..." She doesn't yet know that S came back from today's party with a whole Cadbury's buttons easter egg! But we've reached the end of the day intact and appropriately enough they are playing ballet class together, taking it in turns to be teacher. Sounds idyllic doesn't it? Don't be fooled. It could quickly descend into a "She did this, she did that.... MUUUUUUMMMMM!" I have been irked by an image circulating facebook recently. It is not because I don't admire the sentiment behind it, and it is in support of a fantastic fundraising effort for a charity dear to my heart, but basically I don't think it is true. I am a fan of positive thinking and messages of hope but this one does not sit easily with me. 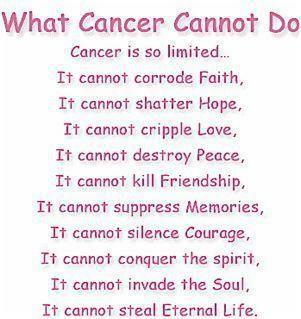 Cancer can do many of the things this statement claims it cannot. I feel compelled to re-write. OK. Normally a blog post takes me a while to craft. 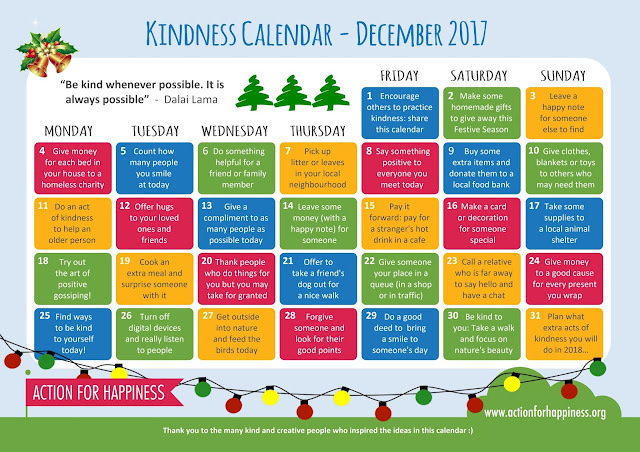 Today I'm going to try being super quick because I just wanted to this advent calendar from Action for Happiness and see if anyone fancies joining in wth me. I don't suppose for a minute that I will follow the suggestion for every day, but even if I do a third of it, and a couple of others join in, we'll have done something good this festive season. It is hard to feel Christmassy in the gorgeous Wellington sunshine we are having at the moment - in the region of 27C top temperature today. Whereas I have friends in various parts of the UK who are braving the snow. But I don't think it really matters if you feel Christmassy or not, this calendar is probably worth a go any month of the year, whatever the season - and unusually for a advent calendar it goes past the 25th. It's that time of year again. This time seven years ago I was under the knife for life-saving surgery to remove a cancerous tumour. It's an anniversary of sorts, although I don't think you'll find a celebratory card in Clintons (not sure if you even have Clintons in NZ - think Whitcoulls or something! ).